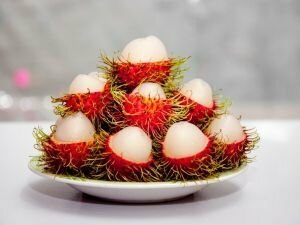 Rambutan is a decorative exotic fruit that is exceptionally popular in the southeast parts of Asia. Rambutan has a hard red-orange skin, under which lies the white and juicy core. Fruits and information about their composition. Storage, choice and consumption of different types of fruits. Exotic and tropical fruits. Undoubtedly, tamarillo is among the most exotic and uncommon fruits. Tamarillo does not possess the characteristic fruit taste - it may be sweet and juicy but you'll also notice slight smokey-salted nuances. . .
Cherry plums are round and colored yellow or red. Over the years, chefs have found use for cherry plums in various marmalades, jams, nectars, compotes, dried fruit mixes and even pickled and canned foods. Prunes are the fruits of the flowering plant Prunus domestica, belonging to the Prunoidae subfamily of the Rosaceae family. Based on some sources, prunes were cultivated in China, eventually spreading west and to other regions around the world. The finger lime (Citrus australasica) is an exotic citrus plant from the Rutaceae family. Interestingly, finger limes come in all sorts of colors, including green, red, orange, yellowish, brown, purple, wine-colored and even black. Buddha's hand is an exotic citrus fruit possessing a strange shape. Buddha's hand bears the unusual name for its unique shape, reminding of a human hand with extremely well defined fingers. Lucuma is one of the most famous fruits in Peru and has been used in local rituals and traditions for millennia. Powdered lucuma is an excellent natural sweetener that can substitute sugar perfectly. Noni is the fruit of the evergreen tree Morinda citrifolia which belongs to the Rubiaceae family. Noni is native to French Polynesia but is found throughout the entire Pacific Ocean region. Noni has green or yellow fruits. Sugar palm(Borassus flabellifer) is a type of palm tree commonly seen in Nepal, India and many other Asian countries. Sugar palm fruits are highly nutritious. Salak takes its place among the top 20 fruits that are relatively unknown to most people in the world but are however, incredibly healthy and delicious. Salak is one exotic fruit that is definitely worth trying.